A Way to Make Any Headphones Wireless. Wireless headphones have been around for a while, but a device that can make any old set of headphones wireless is about to hit the market. Launching their Kickstarter campaign today, the team behind the Spiro X1 wants to give you a no-strings-attached listening experience. 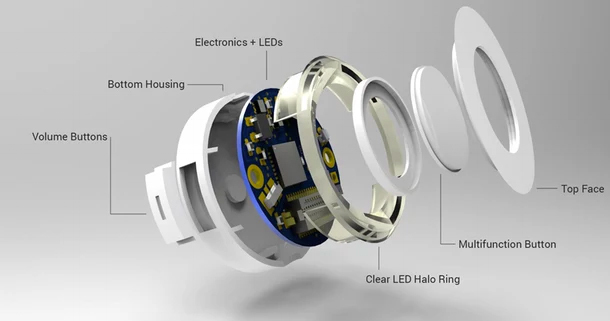 The Spiro X1 (or “X1” for short) is a circular device that plugs into headphones using the connection typically taken by a wire. A user would simply disconnect their wires from the headphone jack and plug in the X1 in its place. Once connected, bluetooth technology allows users to listen to music and answer calls through their headphones with no physical wire. In addition to making headphones wireless, customers can use the product to answer calls and play or pause songs using the X1’s center button, as well as adjust the volume via the side buttons. Also notable are the X1’s proprietary circuit board and near-weightlessness (it weighs less than a quarter of a pound, measuring an estimated 38 millimeters in diameter and approximately 12 millimeters thick). Spiro’s founder and CEO, Daniel Greenberg, got the idea when his headphone wire got snagged on something during the first meeting of the Entrepreneurship Club at his high school in New Rochelle, N.Y. “I said to myself, ‘With all this technology why is there still a physical wire?’ My team and I set out to change that,” he says. Thus, Spiro — which means “sound” in Latin — was born. The Spiro X1 charges by micro-USB, and the battery — not user-replaceable — is expected to last more than five hours. It retails for $50, though people who order earlier can get it for less. Wireless headphones on the market right now can be found for as little as $8 or as much $200. The nascent company has already attracted the attention of three angel investors as well as the Silicon Valley VC firms zPark Capital (formerly zPark Venture) and Thiel Capital, both of whom expressed “major interest,” according to Greenberg. Greenberg hopes to raise $75,000 in the Kickstarter campaign and will put the money toward manufacturing the product. Any funds above the campaign goal will be used to hire more team members and engineers, or to increase inventory. Currently, Greenberg’s team consists of two other high school students and two employees — another high school student and a college graduate. In a few short months, Greenberg will be going to college, too, at NYU’s Stern School of Business. It’s a natural choice for someone who has been entrepreneurial since childhood. “I always had a lemonade stands [as a kid], and I shoveled snow [to earn money],” he said. Eventually, the hope is to license the Spiro X1 and its designs to major headphone companies, which would be a step to the over-arching plan. “We hope, in a couple of years, that wires will exist no more and the Spiro X1 will be the new wire,” Greenberg said.